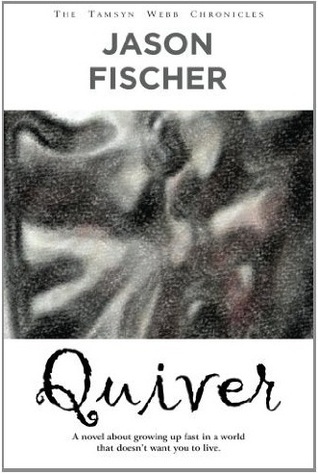 Quiver by Jason Fischer (subtitled The Tamsyn Webb Chronicles) is a young adult zombie apocalypse story. Now I’ve said it in tweet and I’ll say it again – from my perspective it seems genetically unlikely that any Webb could be heroic. But it was an intriguing enough concept that I felt compelled to read. Also, I’ve read and enjoyed some of Fischer’s other works (mainly in short stories, although I did recently read and review his novella Anomaly in the Viral Novella series). The world is almost overrun by zombies, and the hero of the story (Tamsyn Webb) is holed up with a village of survivors in the walled town of Gravesend in the south of England. Tamsyn is a crack shot with the bow (great for bringing down zombies silently) and at the age of 17 is already part of the guards that keep the town safe. The main thread of the story follows Tamsyn’s attempts to find somewhere to live that doesn’t have the constant threat of imminent zombie destruction hanging over it. The book is broken into four parts, based on four novellas originally produced for the After the World magazine (Gravesend, Corpus Christi, Army Corpse and Better Red Than Undead). I hadn’t come across any of the novellas, so I was a bit confused when at the start of the second “chapter” (Corpus Christi) there was a little summary of everything that had happened in Gravesend. I thought “yes, I know all this – I just read it!”. It made a lot more sense when I worked out they were originally independent publications. I would say the novel is targeted at young adult, but there is enough violence and “adult themes” to mean it is probably best read by late teenagers and above. Unless you’re looking to prepare your young teen for the gruesome reality that will be the zombie apocalypse. The writing is excellent (as I’ve come to expect from Fischer), and the story finds a good balance with showing the world spanning nature of the crisis (mainly through the wide variety of locations visited), while keeping the main narrative more intimate (through focusing on Tamsyn’s story). Fischer creates a very horrific environment, both in terms of the description of the zombies themselves, but also the reaction of the human race. The character of Tamsyn is interestingly portrayed, very self involved to the point where I actively had to keep reminding myself that she was only in her late teens to prevent myself getting too annoyed. This led me to find Tamsyn on the edge of being unsympathetic, but that could be the standard reaction of the middle aged towards the young. Fischer treads a good line between showing a young woman buffeted by overwhelming circumstances and giving Tamsyn enough agency to keep the story engaging. Fischer draws on the natural elements to contribute to the general mayhem, and the variety of locations used (from the cold of England in winter to the tropical delights of the Caribbean) means that this doesn’t feel repetitive. Indeed, it could be argued that the unthinking undead are another form of natural disaster. The later two chapters (Army Corpse and Better Red Than Undead) are a bit more fast paced and with more references to military hardware. It did make me wonder whether Fischer was influenced by his work on the Viral Novella series to bring a bit of the techo-thriller genre into his zombie apocalypse. The tension certainly does get escalated as a result, and it is a very effective way of showing the increasingly military nature of the remnants of humanity when faced with a threat of this kind.